Help us keep the flame alive! 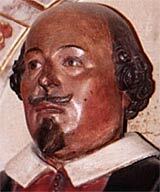 From Shakespeare's funerary monument in Holy Trinity Church, Stratford, considered to be a good likeness. The Sunday Shakespeare Society meets once a month to read aloud a Shakespeare play. Readings take place on the third Sunday of every month at 2.00 pm in the Round Table pub in the heart of London's theatreland. We are a friendly group of like-minded people with a keen interest in the Bard's life and works. For further information, please contact the Hon. Secretary, Sue Taylor, Tel. 020 8500 3768 or email taylorse1469@gmail.com. The Sunday Shakespeare Society was founded in 1874 by Dr F.J. Furnivall in co-operation with the National Sunday League to enable members to use their Sunday leisure time for the study of Shakespeare and further their enjoyment and understanding of his life and works. Banner image. The photo at the top of each page is of the Royal Shakespeare Theatre in Stratford-upon-Avon. The photo source is this page on the Geograph website. The copyright on the image is owned by Christine Matthews and it is licensed for reuse under this Creative Commons licence.